There are certain football pads that are deemed to be a necessity when you are looking for football equipment and others that do not seem to be necessary until you get hit. 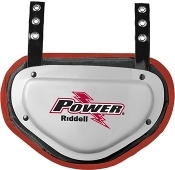 Football Back Plates are a necessity to protect the exposed area below your shoulder pad. 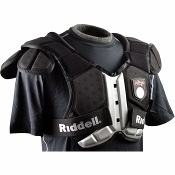 Easily attachable to most shoulder pads, back plates protect your spine, kidneys, and lower back from severe injuries. Back plates come in many forms and styles such as youth, adult and custom. 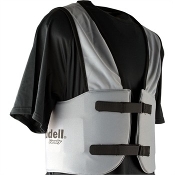 Back plates are lightweight and add vital protection to your lower back. Not only do backplates add protection to your pads, they also add some style to your game as well. Custom back plates are designed with a team logo to show your school spirit or we have special breast cancer awareness backplates available. We can make any custom designed backplate to fit your cause! 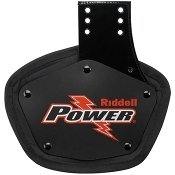 At Endzone Sports, we are committed to serving the football community with the best football gear available, that's why we stock the top of the line and most technologically advanced football back plates available. We have choices in backplates from Douglas, Schutt, Pro Gear, and Xenith for elite protection you can count on! Some back plates are not compatible with all shoulder pads so it is important to ensure the back plate you like fits your shoulder pads before purchase. 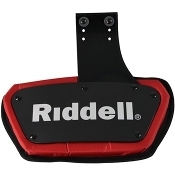 If you need help picking the best back plate or any football equipment, feel free to call our expert staff at Endzone Sports and we would be glad to help! Our main customer service line is (516) 409-2195.